Entries from Digital Intelligence tagged with "groupon"
LinkedIn has launched a global display advertising network, with Lenovo and Samsung among the first brands to sign up. Groupon has redesigned its UK website in a step towards becoming an online marketplace, as the firm moves away from its daily deals roots. As Apple's App Store turns five this week, we take a look at the top 25 paid and free apps of all time on the market leading store. Groupon has ousted its founder and CEO Andrew Mason, after the embattled daily deals site posted another quarterly loss, prompting a 24% slide in its share price on Thursday. The number of discount coupons redeemed through mobile and tablet devices is expected to reach 10 billion this year, up by more than 50% on last year, a new report from Juniper Research has found. Amazon is launching its Groupon rival, AmazonLocal, across Europe, as the online retail giant looks to cash-in on the growing daily deals market. Launched last summer in the US, AmazonLocal offers users time- and location-sensitive discounts on shopping, restaurants, and special events. Like market leader Groupon, the local deals that offer price breaks on everything from spa treatments to flying lessons are shared via email subscription. This chart shows the number of unique users for mobile shopping apps min the US. 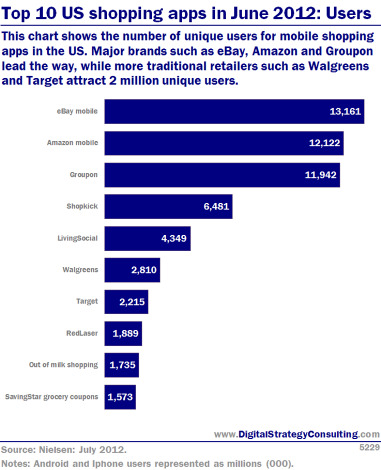 Major brands such as eBay, Amazon and Groupon lead the way, while more traditional retailers such as Walgreens and Target attract 2 million unique users. This chart shows the average time spent using the top ten shopping apps. 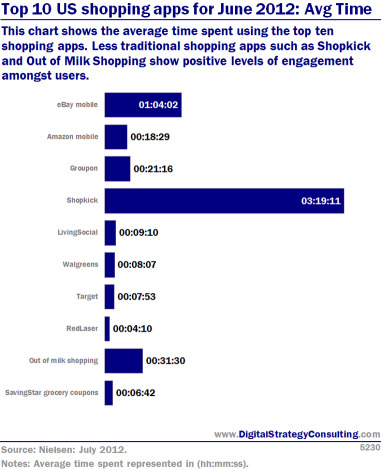 Less traditional shopping apps such as Shopkick and Out of Milk Shopping show positive levels of engagement among users. UK consumers use only four mobile apps regularly, with the most popular ones becoming part of a user's daily routine, according to new research. The study, from user experience agency Webcredible, found that the apps used most frequently are for useful, practical purposes such as journey planning, searching for locations, booking tickets or finding voucher deals. The most successful apps were those that had become part of a user’s daily routine. Groupon has seen its shares fall this week after seeing its revenues fall short of forecasts, despite posting a sound quarterly profit. The online shopping deals giant posted a profit of $28.38 million on revenue that climbed 45 percent to $568.3 million in the quarter ended June 30. The UK arm of Online deals website Groupon has been given three months to improve its business practices after an investigation by the Office of Fair Trading found it has breached advertising codes more than 50 times in a year. Trinity Mirror is expanding into the online daily deals sector, putting the publisher in competition with Groupon. The site, called "happli", lets registered users buy discounted goods. The web and mobile site will showcase a daily selection of deals. The majority (91%) of customers that use a brand via a daily deal site such as Groupon have returned for more business, or are planning to do so, according to new research. While there has been some argument about the impact of daily deal offers on new business, according to the ForeSee survey, daily deal offers do increase business awareness, purchases, and repeat purchases. Groupon is extending its mobile footprint internationally with product rollouts in more than 30 countries and strategic relationships with a number of industry partners, including a location-based marketing deal with Nokia. Groupon has bought Hyperpublic, a small company that develops location-based technology that can be integrated into other applications. The deal could see Hyperpublic‘s tools, such as its "Geo Deals & Events" API integrated into Grpoupon’s offering. The API shows local deals and events depending on where a person is located, such as concerts. Groupon has bought US-based social shopping company Mertado for an undisclosed sum. The move marks Groupon’s second start-up purchase in the social commerce space over the past month. Mertado helps consumers discover new products though social networks, including Facebook. German telecom operator Deutsche Telekom and the daily deals company Groupon have struck a deal to offer its European mobile customers coupons. As per the alliance, Groupon's coupons will be made available to Deutsche Telekom's mobile customers (including T-Mobile customers in the UK) across Europe beginning in the first half of 2012. Groupon outperformed its rivals in November 2011 in the US, increasing revenue while its closest competitors posted declines, according to a new report. The study, from deals aggregator Yipit, found that Chicago-based Groupon's overall billings from its online daily deals rose 6% from October. The figure is triple the 2% increase in the overall November billings for the industry in North America. Online payment service Paypal is to enter to increasingly lucrative discount coupon market, taking on the likes of Groupon and Living Social in the process. The eBay-owned business is aiming to launch the service in the US before April 2012. Speaking to news agency Bloomberg, Paypal's president, Scott Thompson, said the firm would use its knowledge of its 103 million members' past purchases to tailor offers. Online voucher giant Groupon has announced its plans to create a social network despite falling share values, according to a news report. The Daily Telegraph reports that Groupon wants to venture into social media marketing by creating its own network for premium subscribers. The so-called Groupon Reserve is currently in the testing phase in New York, offering more high-end deals to some of its wealthiest users. Over half of consumers (56%) would buy from an unfamiliar brand if offered the right deal at the right time, while 41% have bought purchased something online they would never previously thought of buying, because of a voucher or offer, according to new research. The study, from affiliate marketing network, LinkShare, looked at the increasing popularity of voucher and discount sites in the run up to the festive season. Groupon rival LivingSocial is getting ready to announce a massive $200m funding round that will value the startup at more than $5bn, according to a news report. The New York Times reports that the deal is expected to close next week, and will include both old and new investors. In December 2010, Amazon.com invested $175 million in LivingSocial, an investment that came as Google was considering buying Groupon. Daily deals site Groupon has raised $700m after increasing the size of its initial public offering, becoming the largest IPO by an internet company since Google in 2004. Groupon has made it trading debut on the Nasdaq Stock Market under the ticker symbol "GRPN." The float follows other high-profile technology firms offering shares to the public this year, including LinkedIn, Russian search engine Yandex and Japenese social network RenRen, which all floated on the Nasdaq exchange.